Etymology: Greek, deinos, “terrible” and Greek, onych- (onyx) “claw” + us, Terrible Claw. Etymology: latinized-Greek type species name antirrhopus (an-TIHR-o-pus) "counter-balancing" refers to its stiffened tail, used as a dynamic stabilizer when attacking with the feet or when running. Locality: YPM 64-75, NE 1./4, Sec. 17, T7S, R24E, Carbon County, Montana. Material: A complete left pes and an incomplete right pes. Note: MARSALL, BRINKMAN, LAU & BOWMAN, 1998 show that the second pedal digit PII had osteomyelithis. 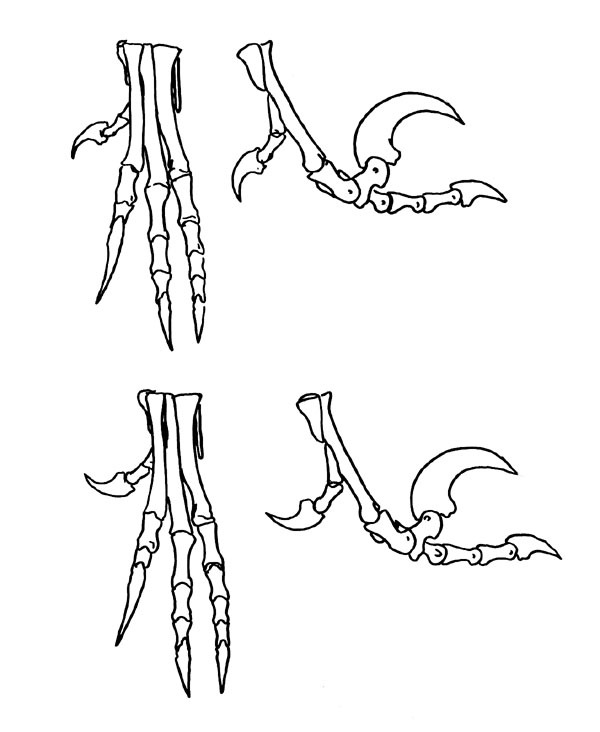 Top MT I with claw facing metatarsals; Bottom, MT 1 with claw facing away metatarsals. Locality: YPM 64-75, NE 1/4 Sec. 17, T7S, R24E, 1.5 miles (2.4 km) NE of Tom Edwards ranch on north side of knob, Carbon County, Montana. Horizon: Unit VII, 14 to 17 feet (4.2 to 5 m) above Unit VI, Cloverly Formation. YPM 5201, 5202, 5203: 3 series of articulated caudal vertebrae. YPM 5204: Part of the atlas, axis, fourth and fifth cervicals and the fourth, sixth, seventh and ninth dorsals. YPM 5206: Nearly complete left and right manus. YPM 5210: Incomplete skull and jaws, vomers, left and right quadratojugals, both squamosals, a left articular, left and right pterygoids, a right ectopterygoid, right surangular, left jugal, right angular, left dentary, numerous teeth, the atlas, axis, 7th cervical, 1st and 10th dorsal and an anterior 3rd or 4th caudal. YPM 5232: Right maxilla, right and left nasals, right and left dentary, right and left (incomplete) premaxillae, right and left jugals, right squamosals, both postorbitals, right lachrymal, right and left articulars, left palatine, left angular and right quadratojugual. Locality: AM 31-7, “Cashen Pocket”, NW 1/4, Sec. 33, T4S, R29E, 0.5 miles (0.8 km) SE of the Cashen Ranch House, Big Horn County, Montana. Horizon: Unit V, 23 feet (7 m) below Unit VI, Cloverly Formation. AMNH 3015: An incomplete skeleton lacking skull. Note: Found with a specimen of Tenontosaurus tillettorum AMNH 3014, and eggshells of Deinonychus. Locality: AM 32-5, SW 1./4, Sec. 8, T5S, R30E, 6 miles (9.6 km) SE of Cashen ranch House, on Mott Creek, Big Horn County, Montana. Locality: AMNH 33-1, SW 1/4, Sec. 26, T7N, R16E, Wheatland County, Montana. Horizon: UNIT VII, 60 feet (18M0 below Unit VIII, Cloverly Formation. Note: Associated with Microvenator celer AMNH 3041. AMNH 3037: Fragmentary foot bones. Locality: YPM 62-6, SW 1/4, Sec. 3, T52N, R92W, 6 miles (9.6 km) WSW of Shell, Big Horn County, Wyoming. Horizon: Univ V, 30 feet (9 m) below Unit VI, Cloverly Formation. Locality: YPM 62-14, NW 1/4, SE 1/4, Sec. 28, T58N, R95W, 1.75 miles (3 km) WSW of Tillett Fish Hatchery, Big Horn County, Wyoming. Horizon: Univ V, 20 feet (6 km) below Unit VI, Cloverly Formation. Locality: YPM 63-18, NW 1/4, Sec. 28, T58N, R95W, 20 yards (18 m) NW of YPM 63-17, Big Horn County, Wyoming. Horizon: Unit VII, 2 to 8 feet (0.6 to 2.4 m) above Unit VI, Cloverly Formation. Locality: YPM 63-19. NW 1/4, Sec. 28, T58N, R95W, 30 yards 927 m) NW of YPM 63-18, Big Horn County, Wyoming. Locality: YPM 64-18, SW 1/4, Sec. 33, T4S, R29E, 350 yards (320 m) east of YPM 64-17, 1 mile (1.6 km) south of Cashen ranch house, Big Horn County, Montana. Horizon: Unit VII, 45 to 50 feet (13.7 to 15 m) below Unit VIII, Cloverly Formation. Locality: YPM 64-27, SE 1/4, Sec. 35, T4S, R29E, 300 yards (275 m) SE of YPM 64-26, Big Horn Country, Montana. Horizon: Unit VII, 10 feet (3 m) above Unit VI, Cloverly Formation. Locality: YPM 64-33, Sec. 6, T5S, R29E, 300 yards (275 m) SW of YPM 64-31, Big Horn County, Montana. Horizon: Unit VII, 1 foot (0.3 m) above Unit VI, Cloverly Formation. Locality: YPM 64-41, NW 1/4 Sec. 21, T5S, R28E, 1 mile (1.6 km) west of Thor Lande ranch on Push Creek, Big Horn County, Montana. Horizon: Unit VII, 8 feet (2.4 m) above Unit VI, Cloverly Formation. Locality: YPM 64-52, SE 1/4 Sec. 29, T7S, R24E, 2.5 miles (4 km) SSE of Tom Edwards ranch house, Carbon County, Montana. Horizon: Unit VII, 35 feet (10.5 m) above Unit VI, Cloverly Formation. Locality: YPM 64-64, T6S, R24E, 4.25 miles (6.8 km) NNE of Tom Edwards ranch, 3.75 miles (6 km) ESE of Bridger railroad station, Carbon County, Montana. Horizon: Unit VII, 18 feet (5.5 m) above Unit VI, Cloverly Formation. Locality: YPM 64-65, SW 1/4 Sec. 34, T5S, R24E, 2.5 miles (4 km) NE of Bluewater Creek Fish hatchery, Carbon County, Montana. Horizon: Unit VII, 25 feet (7.6m) above Unit VI, Cloverly Formation. Locality: YPM 64-72, SW 1/4 Sec. 5, T6S, R24E, 0.25 mile (0.4 km) south of YPM 64-71, Carbon County, Montana. Horizon: Unit VII, 5 feet (1.5 m) above Unit VI, Cloverly Formation. Locality: OMNH V706, southwest Atoka County, Oklahoma. Horizon: Antlers Formation, Upper unit. Age: Cashenranchian age, Lower-Middle Albian Stage, middle Gallic subepoch, lower Cretaceous Epoch, Early Cretaceous. Locality: OMNH V212, southwest Atoka County, Oklahoma. Locality: Locality 241-50, includes the field number 121-50 and consists of a roadcut on an unlabeled dirt road branching west from Farm-to-Market Road 730. The locality is situated about 0.5 kilometer west of the road at coordinates 33°22’15”N, 97°33’30”W, Wise County, Texas. Horizon: Paluxy Church Formation, Trinity Group. Age: Comanchean, Lower Cashenranchian age, Early to Middle Albian Stage, Middle Gallic subepoch, upper Early Cretaceous Epoch, Early Cretaceous. Number: Not given: Broken teeth found near a complete left pes of Pleurocoelus sp. Locality: Locality 123-50/124-50, a very simple gully systems just off the dirt road west of farm-to-Market Road 750, located at 33°22’15”N, 97°33’24”W, Wise County, Texas. Number: Not given: Teeth, phalanx. Locality: Willa Walla Bone Bed, 33°34’05”N, 97°29’58”W, in the northeastern part of Montague County, It lies adjacent to Farm-to-Market Road 1630, Texas. Locality: Greenwood Tank Gully is a relatively rich badlands area of considerable extent in north-central Texas, occupying at least 10 acres. The gullies vary in depth and may be as much as 5 meters deep in some places. The locality is situated off Farm-to-Market Road 1655, slightly less than 1.0 kilometer south of Forestburg, 33°29’49”N, 97°35’14”W, Montague County, Texas. Locality: Section 14, Twp. 54N, Rang 92W, Park County, Wyoming. Horizon: Upper Little Sheep Mudstone Member (Unit V), Cloverly Formation. Age: Cashenranchian, Late Aptian Stage, middle Gallic subepoch, lower Cretaceous Epoch, Early Cretaceous. Note: Found with the partial skeleton of Tenontosaurus tillitorum, FMNH PR 2261. Note: With bite marks from Deinonychus antirrhopus on right fibula, left radius. Locality: MOR CL-121, east of Bridger, Carbon County, South-central Montana. Number: Not given: 2 teeth. Locality: MOR CL-103, 2.1 km north of Bluewater Creek Fish Hatchery, Carbon County, Montana. Horizon: Base of Unit VII, upper Himes Member . Number: Not given: 11 shed teeth were found in intimate association of an almost complete Tenontosaurus (MOR 682). Locality: 1 km south of the Cashen Ranch house, NE 1/4, Sec. 32, T4S, R29E, Big Horn County, Montana. Horizon: Upper part of Unit V, otherwise known as the Little Sheep Mudstone Member of the Cloverly Formation. MCZ 4371: Fragments of snout and mandibles with teeth, a nearly complete but poorly preserved vertebral series including the entire tail, the right forelimb and manus, fragments of left manus, a complete pelvis and sacrum, both hind limbs and feet and various rib and gastral fragments. Locality: MOR CL-016, Middle Dome Area, Wheatland County, Montana. Horizon: Lower Cloverly Formation, basal unit VII. Locality: Pryor Mountain field near Wolf Creek (Red Creek), Carbon County, Central Montana. Horizon: Cloverly Formation, Unit VI. MCZ 8791: Fragmentary left maxilla, 1 complete and 2 fragmentary maxillarty teeth, a complete right articular, 1 cervical, 5 dorsal, 3 proximal caudal, 3 mid-caudal vertebrae, 2 partial (left and right) coracoids, proximal and distal ends of the right ulna, a proximal end of the left radus, a complete manual II-2 phalanx, an ilium fragment with an ischiadic peduncle, a fragment of the distal end o f the femur, a partial tibia, a proximal end of fibula, a proximal end of the right pedal II-1 phalanx, a proximal end of the right pedal IV-4 phalanx, a proximal end of he right pedal IV-1 phalanx, and a partial right pedal II-3 ungual. OMNH 50268: Small sub-adult specimen. Locality: Wolf Creek Quarry, Montana.